In 2007 an ambitious plan/proposal was drawn up to make an F1 circuit running over the Ngurah Rai bypass highway from Nusa Dua to Kuta to South Sanur, and over the water on a flying highway. This ambitious design included the creation of several new islands by reclamation for the Benoa Bay megaproject. Private corporate interests were, and are, the main participants in this scheme. These private interests were also intrinsically involved in the design and creation of the Simpang Siur Underpass and the “Bali Mandara” Flyover Tollroad. And, for their part, persons in the Bali and national government have collaborated in the comprehensive private-public plan for all of this, but without informing or consulting the People or their representatives. The megaproject plan proposes the creation of new land in the middle of Benoa Bay through reclamation (piling up rock, earth and other material that has been excavated elsewhere), extending to more than 800 hectare (2,000+ acres). 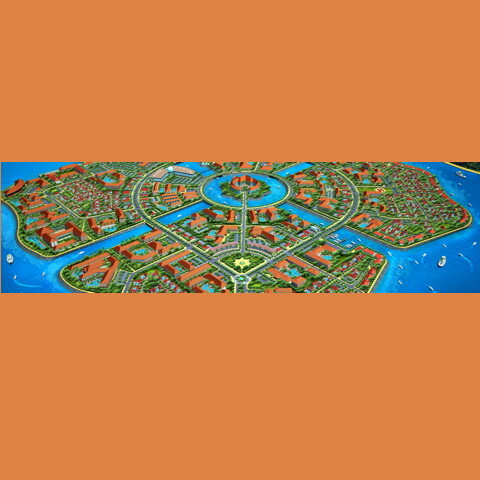 It includes yacht basins, racetracks, casinos, nightclubs, a large entertainment complex and theme park, big resort hotels, mid-class hotels, a golf course, a large luxury shopping complex, restaurants, bars, cafes, apartment buildings, and large numbers of condominium homes and villas for sale/lease. The plan is evidently based on a feeling of envy and competition with Singapore and the Emirates, and strives to emulate (albeit in an inferior knock-off way) the Jumeirah Dubai development, and the Marina Bay Sands and F1 night circuit in Singapore. The personal and psychological motivations here are understandable, but the development plans spawned by them are unsupportable, illogical, and ill-founded financially and otherwise. The existing hospitality room stock in Bali is already well in excess of demand, and recent reports and statistics have shown this clearly, with unprofitably low occupancy rates, and price wars, causing an economic crisis in the hospitality sector with the money coming in being inadequate to cover operations, salaries, maintenance, and obligations to investors. This is not likely to improve, it is more likely to worsen. Be aware, as well, that while government statistics for tourism arrivals in Bali continue to increase, the length of stay of these tourists, and the amount of money spent per day per person, have been decreasing dramatically. The result is that the actual total revenue from tourism in Bali is dropping. The business is shrinking here, not expanding. A tremendous number of new hospitality room units are already permitted and in the construction pipeline in Bali, even without this Benoa mega-project (see Facebook page, “Bali: How Much Is Too Much?“). Official statistics cite 6,000 to 9,000 new room units coming into the already saturated room market during the two years ahead, increasing the total room stock here by more than 25%. Looking deeper than the official statistics, fact-checking in the field and independent research shows the number of new rooms will be even greater than that, as many projects destined for the hospitality market are being created in “grey areas” that evade detection by official agencies. The global economy is generally soft and softening. Hopes of an ongoing boom in China-and-Friends driving tourism and investment have gone flat and are flattening further. Japan: same. Europe: worse. America: in dire straits. The markets that Bali wishes to reach out to, have limited disposable income now, and that’s likely to get worse. Furthermore, these same markets are being reached out to by other tourism locations that in most instances propose more appealing vacation options and at palatable prices. Enormous development is under way in South Lombok, aggressively pursuing the same tourism consumers that Bali has been pursuing. The beaches are better there, the surfing is better, the airport experience more comfortable and quick, the weather more clement, and the overall value for money more appealing as well. We should consider tourism expansion in South Lombok as a part of the total “Bali-zone room stock,” and as direct competition for existing and future hotels and resorts in Bali. This shows that the price-war and over-supply situation here is even more dire than Bali-only information has led investors to believe. Another large mega-complex like the Benoa reclamation mega-project is not viable economically. As proof of this, consider how the Pecatu mega-complex has, even after all these years, remained mostly incomplete, unoccupied, unsold, and still walking the investment streets looking for punters. It’s not full. It’s not done. See also, for assessment of retail development viability, the Kuta Galeria (“Ace Hardware Mall”), which is still mostly empty, and rapidly deteriorating, with most of it never having been occupied by paying tenants ever at any time, and Beachwalk (struggling), and the Centro mall (struggling). This Benoa Reclamation mega-project scheme was kept quiet from 2007 or earlier until the re-election of Bali’s Governor, Mangku Pastika in mid 2013, then suddenly it was announced as a fait accompli with no prelude or consultation or socialization process. Why was it hidden for so long? Why was it suddenly announced only after the (still-in-dispute) election results were finally made official? If the project were indeed a wise and beneficial choice for the responsible protection and development of the well-being of the people of Bali, then why was it hidden for so long? The question marks around the Governor’s re-election itself cannot be ignored. It was a close race. And the poll results were ambiguous, uncertain, and numerous unacceptable incidents occurred around the process of voting, vote-counts, ballot-box delivery and processing, and ratification of the results, to the point that these irregularities were brought to the Indonesian Constitutional Court. Subsequently, and rapidly, a very questionable and peculiar decision was handed down by Akil Mochtar, the then Chief Justice of the Constitutional Court, who is now in custody having been arrested by the Anti-Corruption Comission in the act of transacting the “sale” of another similar election, and with methamphetamines and marijuana in his desk drawer. His decision on the Bali election makes good reading, and is available online. In this decision Akil threw out the one-person-one-vote basis of democracy in Indonesia, officially ratifying the legality of one person voting multiple times using other peoples’ ballots, even those of people they do not know. In the Bali election one single man voted 188 times (for the incumbent, Governor Mangku Pastika), and scores of others punched multiple ballots that did not have their name on them, with impunity. And so Akil, in a gross travesty of democracy, has legalized the purchasing of ballots, and of a single person voting more than once with an unlimited number of ballots. This is a very regrettable reversal of hard-won democracy in Indonesia, which has been declared legal and valid by Akil Mochtar. Now the option to take other people’s votes (if they don’t know or don’t protest), is legitimised, and is absolutely and without restriction a valid option available in Indonesian elections as a rule, including the upcoming presidential election early in 2014. This signifies the end of democracy in Indonesia, officially. So the “results” of the Bali election were decided entirely by Akil Mochtar alone (a man who is now in jail for corruption and drugs). Then immediately thereafter, the Benoa megaproject was announced in Bali. This merits careful consideration. A variety of credible sources have indicated that Akil was paid cash in the amount of US$8 million to throw this election, presumably with additional undetected cash and non-cash compensation, as well. The Governor of Bali issued a decree (“SK”) permitting in principal this mega-project (without any clear logic to support it), subject to the normal environmental impact assessments that apply for any such building work. The environmental impact assessment and reports came in and they determined unequivocally that the proposed project was unfeasible and unsupportable from an environmental and legal point of view (legal, meaning compliance with basic legislation regarding shorelines and small islands, which is extremely important for this nation of islands and shorelines). Following this, after protests and lawsuits by concerned citizens, the Governor rescinded this decree. Some people cheered. Prematurely. The fact was the Governor had quietly issued ANOTHER decree THE DAY BEFORE he publicly rescinded the previous one. In the new decree, he gave permission to proceed for the reclamation project with different terms, including an open period of up to two years to re-write conservation laws and re-arrange environmental impact assessments. THIS is what has been going on since August. The focus of the efforts of the investors who stand to profit has been to engineer a clever and pointed re-wording of the laws about Indonesia’s shorelines and small islands. With this re-wording, they intend to create a loophole where this particular protected shoreline is no longer protected. It’s a very obvious tricky manipulation, and it contravenes the constitution, numerous laws and procedural regulations. But it looks like this sleight of hand may succeed. If it does, then “abandon all hope, ye who enter here.” They’ll be throwing out the most basic spirit of the law and the constitution, for the financial and personal interests of a handful of rich people. Fact. Everyone who cares about the global environment, the sustainability of human life on earth, the achievement of a harmonious civil society, and the furtherance of the human project, should study this situation carefully. If you have to try to figure out Indonesian documents and can’t, let me know. I’ll do faithful translations or explanations for you. What we have here is a program based on denial of basic economic and financial principles and realities. Not to mention environmental ones. Seriously, the investment viability of this reclamation project is nol. It’s a black hole for money. And it looks like a dirty black hole, at that. Not to mention, it will destroy the coastline of Bali from Kampung Bugis Benoa to Tuban, Kuta, and Serangan, all the way up to Sanur and beyond. The runways of the airport will be threatened by abrasion and it’s going to be expensive to try to save them from cracking into the mucky coastline once the mangroves are dead. And we may well have to say goodbye to Sanur, Padang Galak, Gumicik, Pantai Purnama . . . . and Bali’s viability as a tourism destination, and ecosystem, and the only homeland of the Balinese people, their culture, and their religion. Forever. This is the best summary of the situation I've seen (even though it's six months since it was written! ), I didn't know the whole history. Susi, do you see any changes/hope on the horizon with the recent political developments at national level (assuming MK upholds the election results)? Or does what happen in Bali stay in Bali? Thank you. I wrote it because I care a lot about this issue. There is quite a bit of hope on the horizon. Local groups (many) and towns are now publicly coming out against the Benoa reclamation project. The president, and the governor of Bali remain STUBBORN, and the stubborner they act, the stupider they look. The election does make a difference. People are not afraid to speak out . . . It's nice to see such an ambitious project, but I think they should build in another place, like Surabaya perhaps and leave Bali alone. Bali is nothing once its culture is lost. I cannot imagine once Bali becomes modern & all are fake like Singapore. Please tell me where people can go online to support this in other ways, since the petition is closed. I will edit the post, and put a relevant link in to replace this one.